Flutter plugin that helps you create immersive experience for your app by defining margins based on system bars dimensions. This widget provides info about system bar heights and if software navigation bar is present to its descendants. You have to pass in the builder in which you get SystemBarsInfo object and device Orientation for convenience. The child parameter is optional. You can pass child parameter to SystemBarsInfoProvider constructor and it is not affected by changes in layout. This widgets encapsulates SystemBarsInfoProvider and lets you choose which margins you want to show based on system bars in specified orientations. Plugin is currently implemented only for Android platform. On iOS it reports system bar heights as 0 and navigation bar as non existent. 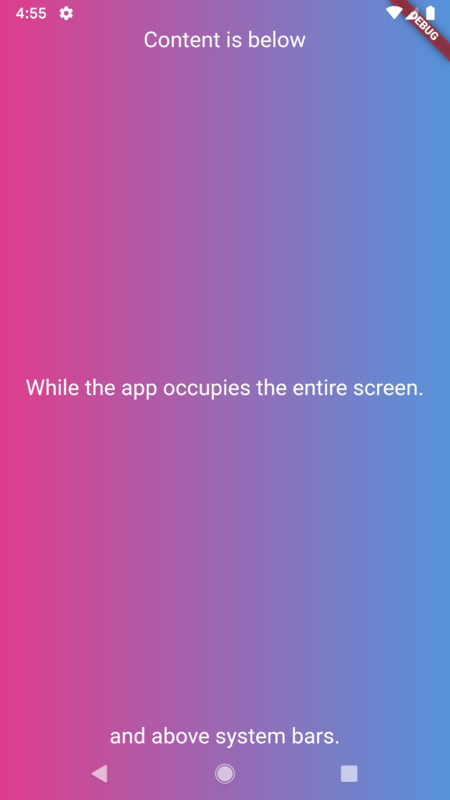 That is because I am a poor student who doesn´t have money for iPhone and Mac so I can't write iOS implementation. If you want to implement iOS functionality please open a pull request. Demonstrates how to use the flutter_system_bars plugin. Run flutter format to format lib/flutter_system_bars.dart.